Israel’s high court on Thursday upheld a 2011 law imposing stiff sanctions on those advocating boycotts of Israel or its colonial settlements in the occupied West Bank and Golan Heights. The so-called Law for the Prevention of Damage to the State of Israel through Boycottallows entities to sue and win compensation from individuals or organizations that call for economic, cultural or academic boycott. It also allows the finance ministry to financially penalize any organization that receives state funding that participates in such calls. The court threw out only one minor provision of the law, which would have allowed anyone to sue for boycott-related damages without showing proof they were harmed. Adalah is one of eight civil society organizations that had petitioned against the law, along with the Association for Civil Rights in Israel, the Public Committee Against Torture in Israel, HaMoked – Center for the Defence of the Individual and Yesh Din. 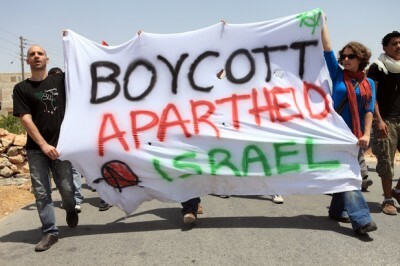 Three petitioners are organizations that have actively promoted economic boycott as a means of pressure to end the occupation: the Coalition of Women for Peace, the Higher Follow-up Committee for Arab Citizens in Israel and the Jerusalem Legal Aid and Human Rights Center. “The anti-boycott bill is one of a host of racist and anti-democratic legislation aimed at silencing opposition and curtailing the rights of the Palestinian minority,” the Coalition of Women for Peace said in a statement condemning the court’s decision. The Coalition of Women for Peace initiated Who Profits, a project that researches and publishes information about corporations and other interests that profit from occupation. In their challenge, the petitioners pointed out that the law was discriminatory, as it did not outlaw boycotts for purposes other than supporting Palestinian rights. Israelis have successfully used consumer boycotts for a host of causes, for example in order to fight for lower cottage cheese prices. The Coalition of Women for Peace warned that the decision foreshadows worse to come. “With the absence of legal checks on political persecution in Israel, [Prime Minister Benjamin] Netanyahu’s shocking comments on election day conveying racism and intolerance of dissent will without a doubt be written into law in the coming Knesset [parliament],” the group said. The high court had effectively given “a green light to anti-democratic legislation such as the Nationality bill that seeks to anchor Israel’s Jewishness in legislation,” to a law “instituting a death penalty for Palestinians accused of terrorism” and to a ban on leftist organizations receiving donations. Such bills are “already a negotiating chip” in the ongoing process of forming a coalition government since Israel’s election last month.